2) Time bot will give you time based on NTP server. ... so many other things..
have many users for that. Today we are announcing another Dictionary bot - English - Hindi Dictionary bot. meaning of an English word. myself, Ershad, Ragsagar and Sarath Lakshman. > Which is the most feature-rich and efficient? based apps. like OpenMeetings: More in this line from this blog . by a 3-year old. Trying to write Math equations is really a challenge! One of the most easiest way to create-compile-run C++ files. If you expand then you can find source code. It is very easy to add your enhancement in SchoolOS. FOSS in Indian Schools - A Serious Concern & a Request to Unite. Dear FOSS Enthusiasts and Activists. I am writing this letter to all for a request to create a task force to advocate FOSS in schools. If we fail to advocate Linux in schools then we will be failed everywhere. Most of the computer users like me are using computer from Last 5-6 year or less. They learned everything in college only. Also at our time computer was a costly device. We have not faced much difficult in migrating from Windows to Linux. Now we love Linux based distro and advocate for open curriculum, content , no-patents, no-DRM etc. But today scenario has changed. Computer are available in every Mohalla and Village. many of them are not having Internet connectivity. they are just using some pirated software. This is not a small population. This is a very huge population. This huge population of school students is also including student who do not have money to buy computer but they are learning using cybercafe and coaching classes. If you do not tell them to use FOSS and Linux based Distro, they will continue using pirated window software for next 10-15 year of their life until they got lucky to enter into a college where Local LUG is active and he got change to explore GSoC and other activities OR course curriculum include FOSS. After 7 year, if you wish to give a lecture for advocating FOSS/Linux in a college then Do you think you can convince them to use FOSS/Linux and stop using the proprietary products which he is using from last 10 years? During a workshop of Kids at NCERT, a 5th class kids refused to work on Kturtle because he was using LOGO software from last 1 year. Those who do not know LOGO created very beautiful diagrams with Kturtle. You can only reach engineering students at College level Linux/FOSS promotion and activities. But these student who are going to use proprietary product for they whole school life will go in various domain like art, music, law etc. you can never convince them after their mind-wash. I learned to do advocacy from two side attack. System is like pyramid. Bottom side contains huge student. and tip is controlled by those who run Education system. at top level we need to look for syllabus change and other activities. At bottom side we need to advocate FOSS and Linux principle in schools. Imagine the power of community and collaboration value inside this huge community. This student community need out love, care and guidance. We can together create a task force and think for various strategies to introduce FOSS in schools. If you empower this student community then they can crate whole curriculum and e-learning videos of their syllabus by themselves. * Creating Workshop for discussion. * getting help from NCERT and other institutes. If you want to learn FOSS and Technology then join me. If you want to learn the depth of technology & Coding then join my Lab. Student invited to do Projects with me. Here are few blogs of students who worked with me. I have mentored 5-6 student in last summer. Now i am looking for more students. PS: Laptop is highly required. Wifi is free. This article is written very late. So much late that government has wasted a huge amount of tax-payers money just for buying licenses to use few software which could have been produced by Indian Government itself. We still has time to save huge money wastage money by public and Government. We do not have any machine in real world which can duplicate real world object like table etc. But Software has the most amazing quality which is called Copying a Software. You can create exact duplicate software using copy. Piracy is a illegal use to software. It is misconception that copying a software makes piracy. When you buy a real world object like mug, table, furniture etc, you have full right to do anything with them. Nobody will object you if you resell them or use for any purpose. In Software world. you never own the software, instead you only buy license to use a software with certain Terms and Conditions. Software remain copyrighted with original authors/company. Every software in the world is copyrighted. Many software companies put non-copying, non-sharing as Terms and Conditions to use the software. When you create a copy of a software you may or maynot be part of piracy. For Example, Duplicating Microsoft Windows Operating System is piracy. But Duplicating Ubuntu Operating System is not piracy, as Ubuntu and other Software shipped with Permissive Terms and Conditions which allow and encourage user to create and redistribute copy of the software. Similarly You can copy Firefox, VLC etc, list is long. Software with Permissive Terms and Conditions are called FOSS (Free and Open Source Software). Software is like air. After Roti, Kapda and Makan, next is Mobile and Computer. Computer without Software are useless. Most of the users need Software for daily work. Word Processing Software, Internet Browser are most common software which every computer user need. Government should not purchase license from software companies for using common software. Instead Government must create software. In case If the Software is available under Open Source License it must adopt and improve it. For example, every computer user need Operating System. Let assume tomorrow 50% of Indian public will use computer. If this 50% slot buy proprietary Operating System, and Lets assume the cost of Operating System is RS - 1000. Then the total money outflow will be equal to 570 Billion Rupee. Again this 50% slot will have to buy word processing software and many other software. Total money outflow will be huge. Those who cannot purchase has only option to use pirated software. Indian Govt can actually create common software which are needed by 80% of computer users. Why public should buy the software, Let Govt should create and distribute the software. This will save a huge money. We already have many Free and Open Source Software which can save huge amount of money. Government need to improve these software. Almost all Free and Open Source Software are available free of cost. They are licensed with Permissible Terms and Conditions. These permission enable other developer to modify and thus improve the Source Code and fix bugs. Adopting FOSS will remove vendor lock-in too as FOSS work with Open Standards. Open Standards are needed for interoperability just like real world. Before we start, we need to learn some important terminology which will be used in this article. First important term we need to learn is Source Code. Its a well known sentence which a common man use "Computer can understand 0 and 1". Human being cannot work at 0 and 1 level. Instead, we use Computer Language like C++ to write a software. A software is just a piece of instruction (like recipe) to do certain task. All the instructions are written into some text files. We call it the Source Code of a software. Proprietary companies convert Source Code to Executable Files(normally .exe files) for hiding the source code. If you do not have source code you cannot modify a software. Another important concept we need to learn is File Format. Software deal with Files. File contain information with meta data. File Contents is stored 0 and 1. File Format is key for transforming File Content into 0 and 1. 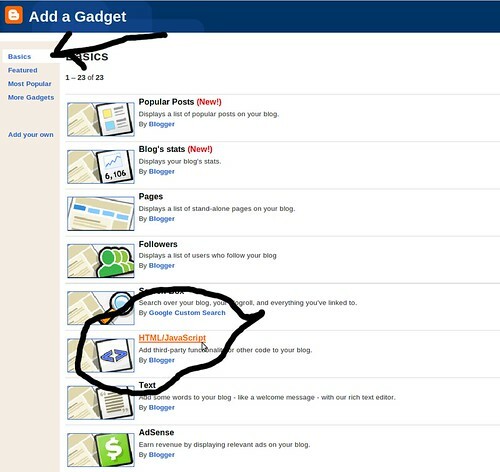 For example webpages are written in HTML File Format. If File Format is open, then any developer can make new software which can open/process the files. These are called Open Standards. Software Industry is running by two camps. One camp is lead by Microsoft which believe in hiding the source code and restricting other to develop good software. This camp mostly work with close standards. The other camp is lead by a large community of Free and Open Source Developers who actually believe in sharing software. Firefox and Open Office is a example of such openly developed software. Both camp is fighting with each other at three layers. The first layer is Software Patent. Companies like Microsoft, Amazon, Facebook etc take patents on their software behavior. For example Microsoft has patent on Page Up/Page Down. Amazon has patent on One Click Shopping. Facebook recently acquired patent on user news feed. These software patent restrict other developer to create software. Also for developers it is impossible to read all patent before writing a software. FOSS community create software with new innovative ideas (like 3D Desktop etc) and do not take software patent on it. Instead these example can be taken for pre-grant opposition for software patents. The second layer is Close Standards vs Open Standards. Many companies work with close standards which they only know Or charge royalties for it. This create a condition of vendor lock-in. Imagine if we store our data on close standards then after 100 year also, we have to go to same vendor to purchase new version to software. You can image close standard as a house which contain your things but they key belongs to some other persons. The third layer is Close Source vs Open Source. Proprietary companies hide source code from users. Hiding source code is again a vendor lock-in process. If you do not have source code then you cannot modify the software. FOSS community encourage user to share their source code. These are the 3 layer where FOSS community fight back at anti-FOSS world. Government should create software for its public. It clear that FOSS software are free of all sort of IPR laws about patent/close standards. Government should modify and improve these software. India has multiple languages. Government must localize these software. There are some field exist where we do not have open standards. Govt must create Open Standards for all purpose. Govt must declare common guideline for hardware vendor for producing driver for their product. If a hardware vendor producing some hardware then it must ensure that driver must be available for "national operating system". Govt should promote SchoolOS and other similar educational initiative for school education. Why you must put your email or website in copyright notice. in your work, then how we can know which "narendra" has done this work? So, in copyright notice, you must put email or website or any other URI for identifying you. 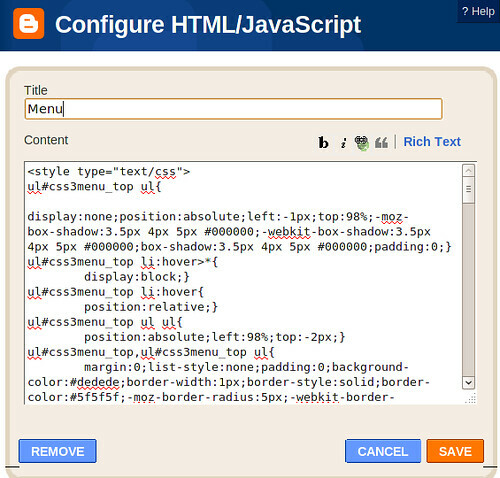 First I will give example and my problem with HTML language. Two days back I have was searching for Cool looking CSS based DropDrop menu. I found a website which were having such menu. I decided to copy it. To copy a specific module from a website is not at-all easy task. We can solve this problem then lots of remix and reusable module will be made. Anyways, I used firebug to search "div" which has code for menu. I extracted that HTML code. Thanks to GOD that it was not a dynamically generated code. I download every css files and looked for "id"s and "class"s which was their in copied code. It was somewhat working. Finally I used firebug to make a side by side debugging to generate exact behavior. Finally I have done it. but when I tried to integrate it on Drupal website, It was not looking exactly same. After some more Firebug debugging, I made some change. It was taking some parent css properties which were not detected using ids and classes. I think, web developed should be done modular design approach. It is just like a local isolated scope for integrating a module. Also, I was thinking to create a GUI for development where anybody can create a nice collaborate GUI for creating 'easily reusable modules'. So I am researching on all options. IANAL , TINLA, I just want your feedback/comment on this. If there exist some content which is under CC-By-NC-SA and someone want to sell it. He can try for selling the DVD at Zero rupee and and add more price in shipping. Shipping charge will include - actual shipping charge + DVD writing charge + your profit. I want your opinion on this trick. Will this still violate NC-clause ? 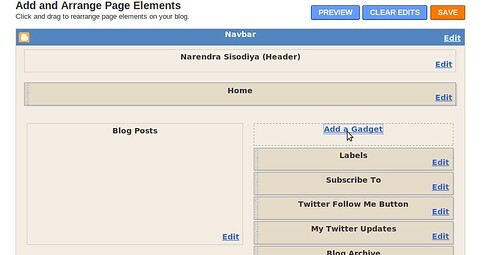 If you see my blog - http://blog.narendrasisodiya.com, you will find a beautiful navigation menu bar on TOP, here is the screenshot. Now add this by clicking on + button , Fill some details and save it. Edit the source code as per your need. You must be aware of DNS. It translate domain name to IP. it is simple fact that you cannot remember IP so we need domain name. Similar things apply with VOIP SIP provider. There is a huge number of free and paid VOIP SIP account providers. We must create single entity to generate unique VOIP account number. --> User will get Unique SIP number and password. --> User will add his SIP provider and other setting. --> On Android or Whatsoever software/hardware, for Video telephony , user will write his unique SIP number and password. software will contact to central server and then download settings. Now if somebody calls you, he will call on your unique SIP number. Software will again contact to central server to get the minimum details to make a video/audio call. May be after, 30 year, you may want to change SIP provide. You can again login to central server and then change your SIP provider. This way you can maintain the unique contact number for creating video/audio calls over Internet. In order to create short code, we may use alphabets instead of number. 10 alphabets code can give 1.41167096 × 1014 unique VOIP sip numbers, which is 20,541 times of the current population. commonly known as Reliance net-connect and Tata Photon and other related models. Other then this, we use GPRS. There is no wifi and 3G yet (I am talking about India and not metro city). If you want to sell Android tablet in India, You must provide Internet connectivity via Wifi & USBmodem & Bluetooth. * They want to use Internet to Facebook update and Chat + Twitter. * They want to use it as Ebook reader. These are main application a normal Indian (atleast at my age) want. Also, one more request, please support open standards like ODT, OGV , SIP, PNG. Webm, XMPP/Jabber.